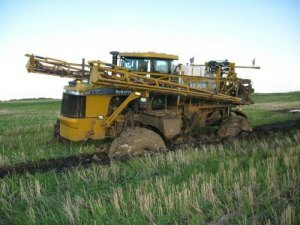 What started out as a frustrating time with spinning tires and sticky terrain has turned into a winning situation for five Saskatchewan farmers. 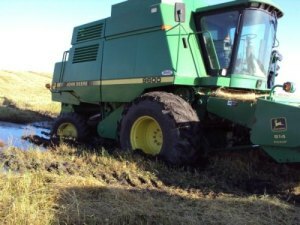 After farmers across Saskatchewan dealt with record rainfall this past spring and summer, Jody “Joe” Kemp, with Flaman Sales in Southey, soon realized that getting stuck in the mud was a province-wide epidemic. 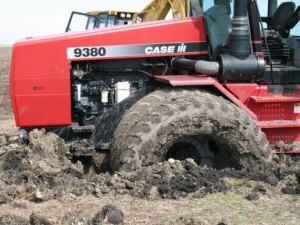 He came up with the idea of the contest where farmers could submit their best “stuck” photos and share their experiences with each other. And share they did – since the contest launched Nov. 8 there have been more than 60,800 visits to www.stuckinthemuck.com as people have viewed and voted for the over 360 photos entered from across the province. 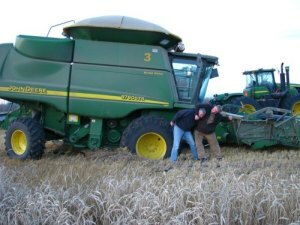 First place winner Carla Debnam, who combined 10 quarters of grain near Churchbridge, agrees the contest has been fun and enjoyed looking at all the “wonderful” photos that were entered. She says it’s nice to win a prize after dealing with such a difficult harvest. 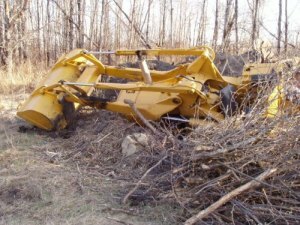 After getting stuck pretty bad this year, Debnam is sure she’ll need a new tow rope. With all the snow, she thinks there could be a wet spring next year. Flaman Sales will also be drawing five random winners from all of the entries on Wed., Dec 22 who will win a new tow rope as well. The winners, along with the Top 25 and all the submitted entries, can be viewed at www.stuckinthemuck.com. Photos can still be uploaded for sharing and the site will remain up for viewing.